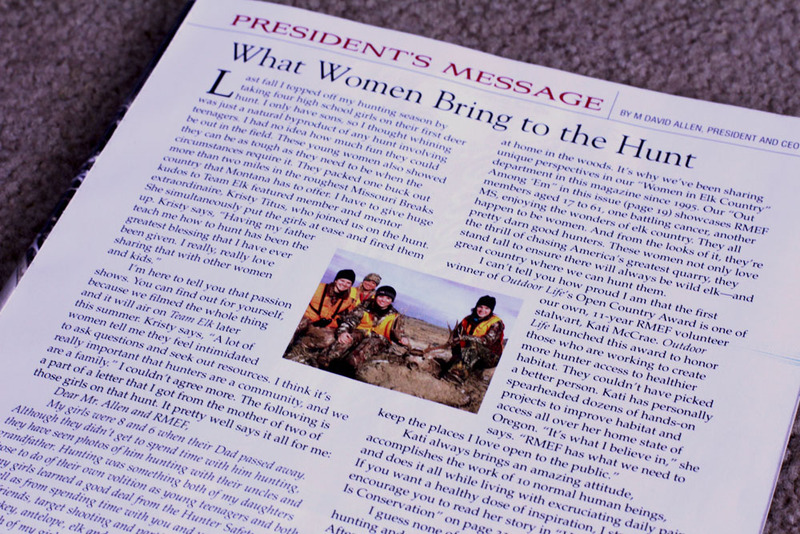 In the May/June issue of the Rocky Mountain Elk Foundation's Bugle Magazine, President and CEO, David Allen highlights the importance of women in the outdoors. Women sharing their passion and love of the outdoors with other women and kids is creating a community and new family of hunters. RMEF invested more than $500,000 to fund 244 workshops giving women the opportunity to learn about hunitng and help them feel at home in the woods. RMEF volunteers such as myself, Outdoor Life's Open Country Award winner Kati McCrae, the first ladies of of the Elk Foundation Vicki Munson, and Yvonne Decker and countless other RMEF volunteers and supporters are pouring themselves, heart and soul into creating a legacy to last for generations to come. If you are not a member of the Rocky Mountain Elk Foundation, join today at www.rmef.org.